Although, I didn't believe it when I first saw it. With all the years that I've heard (or taught) that all DNA is antiparallel, it was hard to believe my eyes. 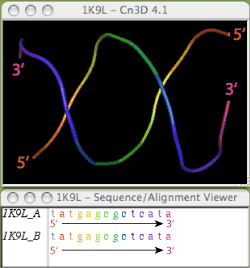 Yet here is parallel DNA, with both strands oriented in the same direction, right here on your monitor. And the commenters were correct. Okay, all of you biochemists and molecular biology types. I have a puzzle for you that I found by accident during a lecture. Yes, I was the one lecturing and the notes will be posted soon. In the meantime, here's your puzzle: What's unusual about this pair of bases? How does grass grow in the extremely hot soils of Yellowstone National Park? Could a protein from a virus help plants handle global warming? Okay, that second sentence is wild speculation, but we will try to find the answer to our mystery by aligning our protein sequence to a sequence from a related structure. The wind storms and heavy rains that hit Seattle a few years ago, and flooded the Battery Street tunnel, demonstrated why a bypass mechanism can be a helpful thing - for both bacteria and motorists. Did you publish a scientific mistake? Blame the software! What's the difference between a synthetic drug and an antibiotic? Sometimes there's no difference at all. Let's take a look at chloramphenicol and couple of pencillins. What is the direction of the rainbow? 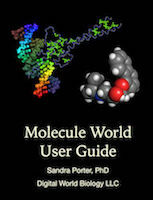 Get the free Molecule World User Guide!